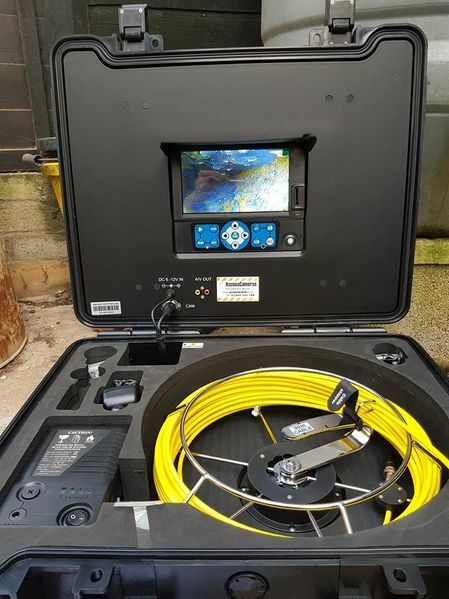 Forest of Dean Pest Control now have Drain Surveying equipment to carry out detailed CCTV surveys to look for and identify broken or displaced pipework that allows access for rats into a property. Separating the fact from fiction, it is very unusual for rats to access a property via the toilet bowl. Rats can get access to a property via broken drains and can damage soft plastic pipework and can cause problems and damage by eating through the pipework. More often than not any access via damaged or displaced pipework can be rectified by a simple patch liner being applied to the hole or displaced joint which stops access for the vermin. As with all problems there are solutions for your rat infestation but the initial and detailed investigations are vitally important if you are to find the correct solution quickly. Far too many people have suffered many years of infestation due to poor advice and incurred great expense in trying to control rat ingress within the property as opposed to stopping them entering in the first place. There is not one magic bullet for all rat problems. I am afraid that quite often a couple of issues have to be addressed in order to sort the problem, below are the most common solutions. The following information on this page is a guide to how rats enter your house via, drains, walls, loft and sub-floors. Also the techniques used to identify where and how rats are getting into your home and proven rat control solutions to prevent them from entering in the future. Domestic rat problems are on the increase due to several reasons including the mild winters, the well documented floods around the country forcing rats to find their way out of the sewer systems, local authorities cutting back on sewer baiting and pest control contracts and as more people are extending their homes poor building practices allow our little friends access opportunities that were previously unavailable. Rats live in all sewer systems but they do take little excursions from the main sewers and into the smaller diameter pipe work that runs straight up to your property, think of the sewers as motorways and your private system as an A road and they have a nice warm, safe and ready-made network in which to move around and before you know it they are literally a whisker away from your cavity wall, sub-floor or loft space. However, if your drainage system is well designed and in a good condition the rats should not be able to leave the sewer network and enter your home, unfortunately many of the defects we find on domestic drainage systems offer all the access a small rodent requires to explore your property. If you are hearing scratching noises in your walls, sub-floors or loft space there could be a few possible explanations such as mice, squirrels or rats so you need a professional pest controller to investigate and confirm what the problem is, obviously if you see a rat in your property (don't panic, most people only hear them) or you see one in the garden you should again call a registered and qualified pest controller. Your pest controller will then give you best advise and the investment on the best method of rat control using either trapping, baiting or other methods to get rid of your unwelcome visitors, they should also be looking around (surveying) the property for obvious points of entry to prevent any future ingress. Holes in brick work for waste pipes, missing or broken air-bricks or gaps beneath door sills can be easily spotted and sealed and your problem is solved. If however there are no obvious signs of entry or you have sealed any access points and you are still having issues after several weeks your pest control contractor should (and sadly many do not) be recommending that you investigate your drainage system as a possible point of access into the property. Whenever anybody mentions that they have seen a rat it is usually followed by "as big as a" Cat, Dog, etc. when in reality there is not a lot to a rat in the way of large bones, they can therefore squeeze through the smallest of gaps and you are basically looking for a hole the size of a 50 pence piece. It is therefore vital that every branch line and connection is surveyed up to gully pots and rest bends adjacent to you house foundations not to mention any drainage that actually runs beneath your property. Redundant drains that have not been capped off correctly during the building of an extension or conservatory is a regular issue, so is building over manholes and not sealing the cover or any disused branch connections within it. These defects can go unnoticed for years and it only takes one Rat or a partially blocked sewer or drain pushing them upstream in search of dry land and they are in, most of these defects will be within a metre of your foundations or even beneath your property, once they find the wall cavity they will have access to all areas. Capp and spot repair liners are used for capping redundant drains, branch lines and manholes, however given that rats can chew through wood, brick and plastic easily a 3mm wall of fibre glass liner offers little resistance to a hungry and persistent rat. I am sorry to say that when we are dealing with a live manhole that has been built over or where a pipe has broken and become displaced the only answer is to excavate, obviously this involves some upheaval and disruption but ultimately it is a means to an end.